Steven (Chicagoland, United States) on 25 January 2010 in Landscape & Rural and Portfolio. Not exactly a runway you would expect your next top model to come strutting down, as this ice-covered sand strata was quite slick, even for me. 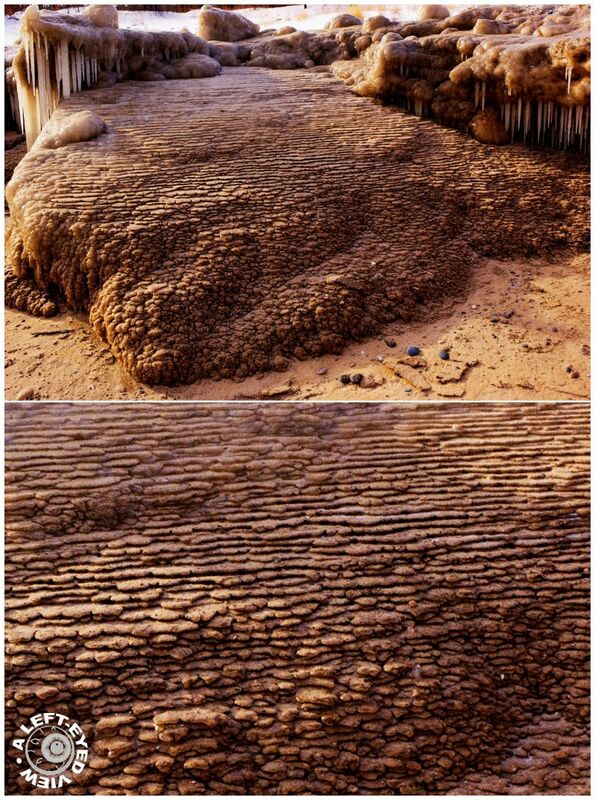 The lower photo is a close-up of this creation of nature, which illustrates these layers of sand. How it was created I will probably never figure out, but it was an intriguing find to say the least. This is an amazing display of ice work by Mother Nature - great shot! This is really an interesting form of nature. thanks for sharing. This is just so weird! If the sand is hard could it be glacial deposits? We are at the end of the road for the glaciers. If that is actually sand.. that you could step on and fall through [provided it's not wet and frozen right now] then maybe it is the result of waves? It's cool looking whatever it is and you got some really good shots of it. That is so cool, exotic even. Super shots of this fascinating find. It looks like layer upon layer flowed down and got frozen in time. Hoped you marked the spot, so when thaw starts you can have another shot of this phenomena. Very intriguing formation. I like the way you've pictured it from a distance and close up. Amazing! Like layers of stone creating a walkway.